VIN-SMF-600 virtical-trivision machine is the new product. It is very popular in the advertising, especially the dynamic effect. Which could deposits in stores, air port, bus station and business center. Our Tri-vision Displays feature signs that display 3-messages in the space of just one. These have three (TRI) sides and enable the users to make maximum information to be displayed. We utilize turning triangles to achieve this look and offer these in innovative colors and designs that assure maximum admiration. 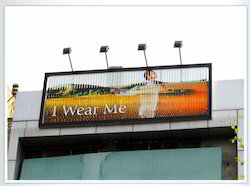 We offer another innovative outdoor advertising option in the form of trivisions which display 3-messages in the space of just one. Our sign has three sides for the vision. • First trivision of 20' x 10' sized was introduced in Gujarat. Trivision has been installed at Athwa gate, Surat. • Two more trivision of 10' x 10' sized has been installed at Sardar briedge, Surat. We are offering wide range of Indoor trivision to our clients that are basically signage that display three messages on a prismatic moving bar fabricated on a single frame one after another. 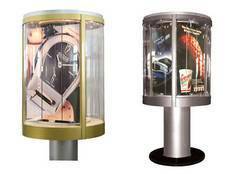 With enriched industrial experience, we have been able to offer a wide spectrum of Tri-vision Signage. Almost all large Trivisions across India are from Admire. Admire supplied over 200 Trivisions to Reliance and 75 Trivisions to Vodafone. We have supplied Trivisions to Nepal, Sri Lanka and Africa. Admire Trivisions have been put up at major Cricket Stadiums across India.